Immunogen Antibody produced in rabbits immunized with a synthetic peptide corresponding a region of human NSMCE1. Application Notes NSMCE1 antibody can be used for detection of NSMCE1 by ELISA at 1:1562500. 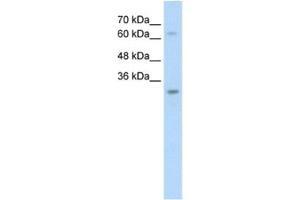 NSMCE1 antibody can be used for detection of NSMCE1 by western blot at 2.5 μg/mL, and HRP conjugated secondary antibody should be diluted 1:50,000 - 100,000. Storage Comment For short periods of storage (days) store at 4 °C. For longer periods of storage, store NSMCE1 antibody at -20 °C.